Saveo is created for senior care, assisted living websites, as well as for nursing homes, hospitals and medical establishments of any kind. The theme has modern and functional design and includes all the necessary features that your healthcare website could possibly need. Saveo is compatible with such premium plugins, as Revolution Slider, Essential Grid, Visual Composer, Booked Appointments, and for showcasing all your services in a best way. Saveo is fully responsive with Retina and SEO readiness. 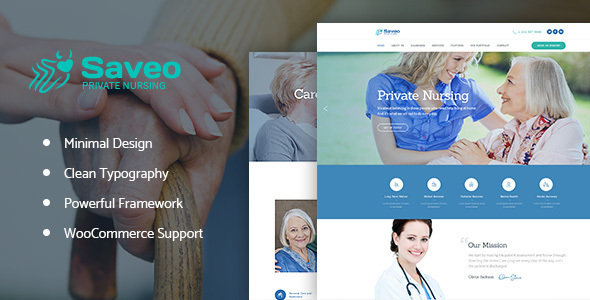 Fully supported with detailed documentation, Saveo is a perfect solution to create a senior care website.